Oesphagectomies have been performed by either a thoracoabdominal, transhiatal or thoracoscopic approach. These methods especially transthoracic procedure have known to have high intra and post operative morbidity. Principle of minimally invasive oesophagectomy is to perform the same operation through a smaller incision thus reducing the operating trauma without compromising the oncological safety. We report our experience of thoracoscopic total oesophagectomy performed in 112 patients in left lateral position. Patients with respectable thoracic or gastro-oesophageal junction tumors and medically fit for 3stage oesophagectomy underwent thoracic total oesophagectomy in the left lateral position. Of the 112 patients procedure was converted to open in 2 patients. 112 patients underwent thoracoscopic total oesophagectomy in left lateral position since June 2005, 80 patients had middle third oesophageal cancer. 100 patients had squamous cell carcinoma as pathology. Te average operating time was 85min (range 40 – 120 min). The average blood loss was 200 ml. the average number of lymph node was 20. 8 patients had post operative complication. Post operative mortality occurred in 3 patients. The average follow up was 18 months. 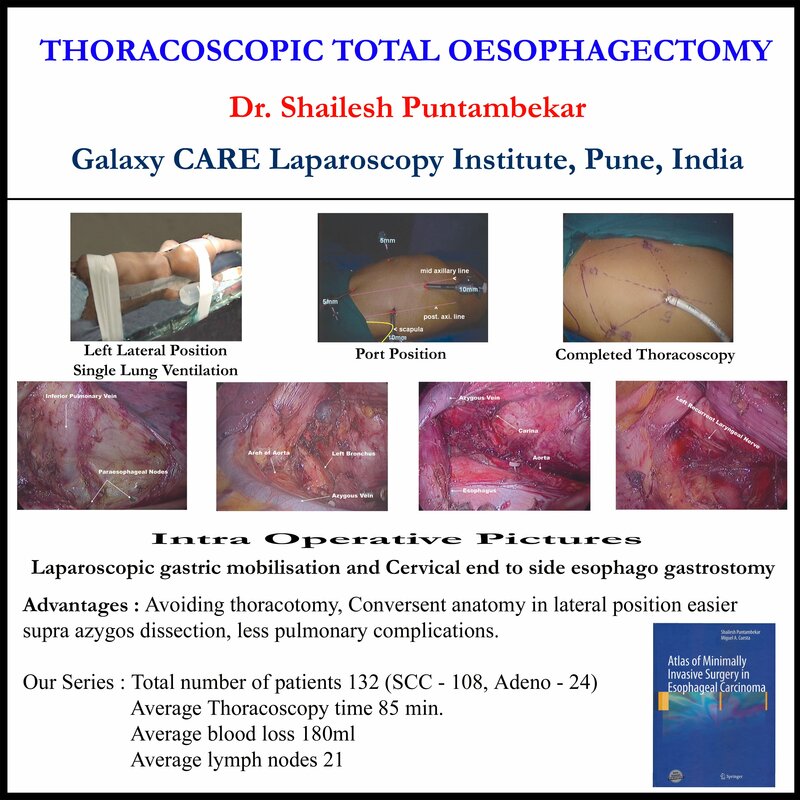 Thoracoscopic total oesophagectomy is a safe and oncologically safe procedure. Anatomical orientation in the left lateral position is the same as in the traditional open technique thus reducing the learning curve in the thoracic surgeon.